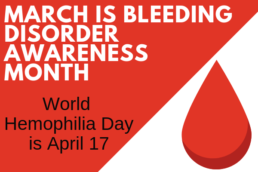 March is National Bleeding Disorder Awareness Month, and April 17th is World Hemophilia Day. The purpose is to spread the word about bleeding disorders and how serious they are. Since blood flows through the entire body, if there is something wrong with the blood, every organ is at risk. Bleeding disorders are classified as a group of disorders that share the inability for the body to form a proper blood clot, which generally involves a blood platelet deficiency. Blood platelets and other proteins found in the blood are responsible for coagulation. Coagulation is the process of blood turning from a liquid to a gel in order to stop bleeding. Hemophilia A.: This is also known as classic hemophilia. It is when there is a shortage of clotting factor VIII (8). Hemophilia B.: This is also known as Christmas disease. It is when there is a shortage of clotting factor IX (9). Hemophilia C.: This is also referred to as Factor XI (11) deficiency. Plasma-derived factor concentrates. These concentrates are created using human plasma. Natural plasma contains clotting factors and other antibodies; the clotting proteins are derived from the plasma and then purified. Recombinant factor concentrates. These are concentrates which either do not contain any human plasma or contain amounts of natural human albumin. Albumin is derived from plasma and then pasteurized. Recombinant factors VIII and IX contain neither plasma nor albumin, and therefore are incapable of transmitting any viruses that can be transferred through blood. Type 1. Type 1 VHD is the most common of the seven types. It is when an individual has low levels of VHF and clotting factor VIII. Type 2. With type 2 VHD, the body produces VWF but it does not function properly. There are 4 variations of Type 2 VHD. Subtype 2A is when VWF levels are so low that platelets cannot clump together as they should. Subtype 2B is just the opposite. The clotting factor is defective and platelets clump together at a higher rate. Type 2M inhibits low VHF levels from interacting with platelets. Finally, type 2N stops VHF from factoring clotting factor VIII. Type 3. This the most severe case of VHD. There is little VHF in the blood with extremely low levels of clotting factor VIII. Desmopressin Acetate (DDAVP) injection. This injection is an inoculation for milder forms of VHD. It is a synthetic hormone which triggers the body to produce VHF, which results in firmer clotting and an increase of factor VIII in the blood. DDAVP is also available as a nasal spray. Factor replacement therapy. In severe cases of VHD or when the body does not respond to DDAVP, injections of clotting factor products replace what is missing in the bloodstream. Antifibrinolytic drugs. Intended to slow down or prevent blood clots from breaking down, antifibrinolytic drugs can be taken orally or injected. Birth control pills. Patients with VHD who are also suffering from heavy menstrual bleeding benefit from birth control pills. The hormones contained in birth control pills can raise VHF and clotting factor VIII levels in the blood. Patients with blood disorders are more likely to require emergency treatment after an injury because it is more difficult for the blood to coagulate, causing excessive bleeding. Since it is an inherited condition, It is important to know family history regarding hemophilia and be aware of the risk. Additionally, some people ignore symptoms for VHD or mistake them for something else. Either way, excessive bleeding can quickly lead to shock if there is no clotting, so always make sure that doctors are aware of any bleeding disorders in the event of an emergency. If you have a bleeding disorder or symptoms that appear to be an emergency, do not hesitate to come to The Emergency Center right away. The Emergency Center provides up to 23 hours of Observation and offers 24/7 care with NO WAITING. Visit one of The Emergency Center’s convenient 24-hour locations in Arlington, Fort Worth, and San Antonio.